The idea of naming a kid is so intimidating to me. My in-laws are big on giving kids “legacy names”, which intimidates me further. What if I only have one kid? Do I name the kid after someone on my side of the family, or my husband’s? How do I pick the person to name the kid after? What if I just want to pick names that I think sound nice/have a cool meaning/are a tribute to non-family members? I’ll be honest, though the decision of picking a name for another human is a bit of a daunting task, I’ve always loved the idea of naming a kid after historical figures/fictional characters that are meaningful to me. It stresses me out far less than trying to pick names from family. Honestly, how can there not be hurt feelings over picking legacy names? Someone will get left out, it’s guaranteed! I legitimately love the name Marshall for a guy. I think it’s a strong name and unique enough that every other kid in his class wouldn’t have the same name. So while this name isn’t wholly inspired by Marshall from HIMYM, you could definitely do a lot worse than sharing a name with a man who was a great friend, husband, and father, who worked hard to achieve his dream as being a lawyer and a judge. Can I tell you how much I would want to have a boy and a girl and name them Luke and Leia? I mean, it would be a real exercise in self-control to avoid doing this. If I’m honest, I’m more of a Han girl than a Luke girl, but I think Han is too weird of a name. Besides, Luke is a great character, and his journey from young, naive kid on Tatooine to a Jedi is an awesome one. Also? Onesies like this exist. Only weird thing here is one of my closest couple friends have also named their kid Luke. However, I’m not above calling our kids Luke 1 and Luke 2. So there are two pretty awesome women of sci-fi named River–River Tam from Firefly and Serenity, and River Song from Doctor Who. Granted, River Tam is kind of a nutter, but she manages to stay strong despite all of the ills she suffered at the hand of the Alliance. More than that, she is a desperately loyal friend and sister to Simon. River Song, of course, is an amazing, smart, witty, and slightly dangerous time travelling archaeologist, and is one of the only humans who can fly the TARDIS, is married to the Doctor, knows his name, and has managed to grow up as best friends with her parents. Both of these women rule. What fictional characters would you want to name your kids after? Let me know in the comments! 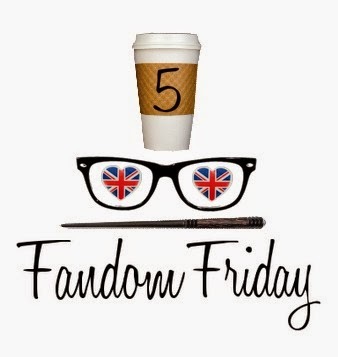 And, as always, check out my other Fandom 5 posts, and see what everyone else is saying by following the #Fandom5 hashtag! Love that you included Eowyn! 3/5 of my names were LotR related too, although I went much subtler. As much love Eowyn and her character, it’s a little “too-fantasy-ish” for me to pass along to any child. Yeah, it certainly is super fantasy-ish. I’m okay with that though. 🙂 LotR just has some great names, doesn’t it? River is a great one! Good choices. And names are important and therefore stressful….I totally understand the freak out! Excellent picks! My brother’s name is Luke, and he’s pretty happy with it. 😀 He’s also a huge Star Wars nerd, so that’s a double scoop of awesome for him haha. When we picked names for our daughter, we totally opted for the ‘screw what anyone else thinks it’s our kid!! !’ mentality. Seems to have worked out! I love River! Both of them! I don’t know about having children, but River is definitely up there on my list of things to name a pet! this is hilarious. I’ve changed the names of my future children so many times over the years as I’ve fallen in love with more characters!